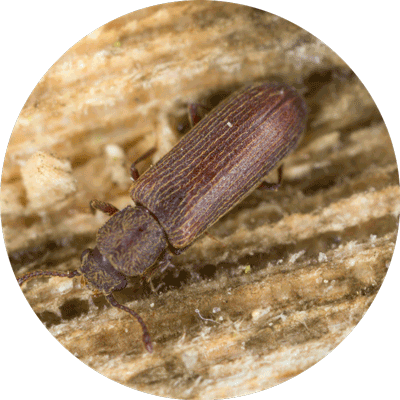 Wood-boring beetles rank just behind termites in the amount of damage they do annually. Unfortunately, your wood can be infested with these pests and you may never know. That’s because hidden larvae cause most of the damage. It can take up to five years for larvae to mature into adult beetles and eat their way to the surface, creating visible exit holes. Pinholes indicate larvae have emerged as adults. When adult wood-boring beetles emerge to mate, they produce exit holes and talc-like frass. You can identify the species of beetle that has infested your wood by the size of the exit hole and frass it leaves behind. 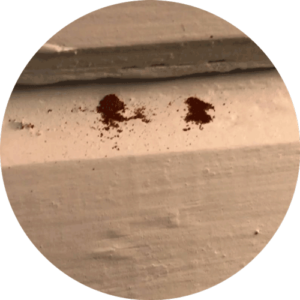 Damage from wood-boring beetles can vary from unsightly pinholes to costly structural repairs. Bora-Care is the best way to protect your home from wood-boring beetles, termites, carpenter ants, wood rot and more. It has low mammalian toxicity because its active ingredient is a borate mineral salt. 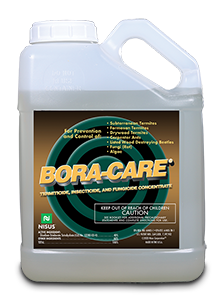 Used as a pretreatment in new construction or to treat existing infestations, Bora-Care eliminates wood as a food source for wood-boring beetles and termites and provides residual protection.